The origins of Russian mining go back to 1913. The real operation, however, began in the late 1920s and the beginning of the 1930s when Trust Arktikugol bought Barentsburg, Pyramiden and Grumant. The Russians bought Pyramiden from the Swedes in 1926. Before the war only test mining was carried out here. After 1948, Pyramiden was rebuilt from the ground. In Grumant there was some Russian coal mining activity between 1920 and 1926 and from 1931 to 1941. Grumant was rebuilt after 1947. 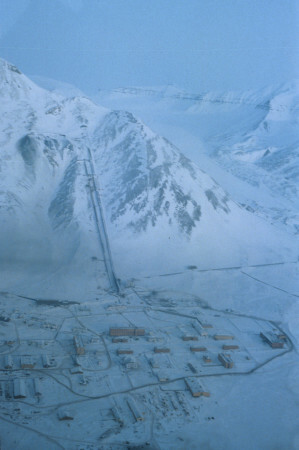 The mining community of Grumant was closed in 1961 and Pyramiden in 1998. Between 1947 and 1955 the number of employees at the Russian mines increased from 1200 to 2500. The rebuilding of the Russian mining towns was completed very effectively and rapidly. Mining continues in Barentsburg and there are just fewer than 600 people living there today. The community has a characteristic Russian feel, with a set system of blocks of flats and streets. The entrance to the mine, the storage area for the coal and the shipping quay lie in the centre of the town. Barentsburg has a heliport, sports and culture building, a cowshed, hothouse, research station, museum, souvenir shop, medical centre and nursery school. Archaeologists, meteorologists, geophysicists and glaciologists work at the research station during the course of the summer season. Barentsburg has a Russian consulate.